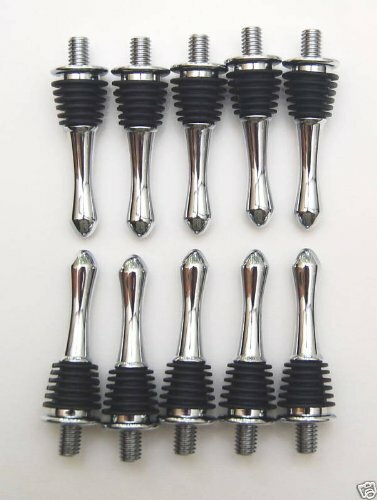 10 PREMIUM QUALITY TEARDROP STYLE BOTTLE STOPPER KITS NOT THE CHEAP CHINESE IMPORT!! CONSISTENT HI QUALITY FINISH Triple Chrome plated - will not corrode! Each Kit includes one Chrome Teardrop Style Bottle Stopper base with 3/8"-16 threaded insert for easy attachment to your artwork. Advantage of the Teardrop Style puts your turned art work closer to the top of the bottle exposing less of the chrome and more of your handywork. No wood is included. Each order will receive detailed instructions and project ideas from my own personal collection. FREE instructions on how to make your own bottle stopper screw chuck from common hardware store parts. Included are some popular turning designs. These high quality chrome stopper blanks have a silicone rubber seal which seals out all outside air, and even holds a seal when the bottle is on it's side. If you have any questions about this product by Custom Woodcrafting, contact us by completing and submitting the form below. If you are looking for a specif part number, please include it with your message.